Diğer bilgiler Description: ***WE HAVE 4X IN STOCK*** YEAR 2013. HOURS 2653. 37HP 3 CYLINDER YANMAR DIESEL ENGINE. 4X4. HST. PAS. ROPS. 10" JUMBO CUTTING HEADS. 84" CUTTING WIDTH. ROAD LIGHTING KIT. The 8400 mower has been designed to meet your key requirements: performance, operator comfort and durability. It offers high capacity 10 inch diameter Jumbo cutting units with an overall cutting width of 213 cm (84?). The cutting units can be lifted with the touch of a button thanks to the CrossCut system that allows all three units to be controlled either simultaneously or independently. Power comes in the form of a turbocharged 37hp engine, ample for even the most demanding of conditions. Mascus Türkiye'de John Deere 8400 TRIPLE REEL MOWER diskli çayir biçme makinasi ilanları bulabilirsiniz. 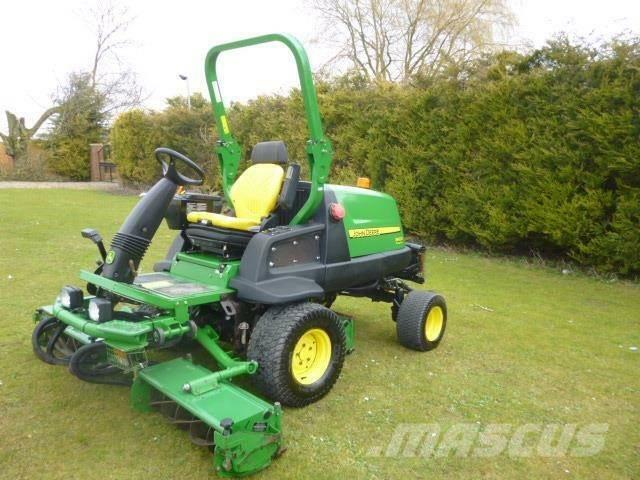 John Deere 8400 TRIPLE REEL MOWER fiyatı 7.783 €dır, 2013 modeldir. Wisbech Birleşik Krallık adresinde bulunmaktadır. Mascus.com.tr'de John Deere 8400 TRIPLE REEL MOWER ve diğer markalardan diskli çayir biçme makinasi ilanları bulabilirsiniz.